The Hospitality industry is one of the most booming sectors across the globe. You think of something and it’s related to the Hospitality industry in some way or other. As a tribute, these Funny pictures are dedicated to the hospitality fraternity. There are several great things about Hospitality which we have mentioned on this website through various posts. In this Global Hospitality Portal, we have tried to cover the Most Beautiful Hotels in the World to Working on Cruise Ships and everything in between. We dedicate this post to hard-working professionals of the hospitality industry. You deserve some fun time and this post makes an effort to do exactly the same through a few funny pictures related to the hospitality and travel industry. To bring a few smiles to the faces of hospitality industry professionals, in this post we have compiled a list of few Fun Pics related to hospitality industry. Hope it will be a quick breath of fresh air during your super busy shift. This compilation of Fun pics is a pun intended one and we request you to take it in the same manner. 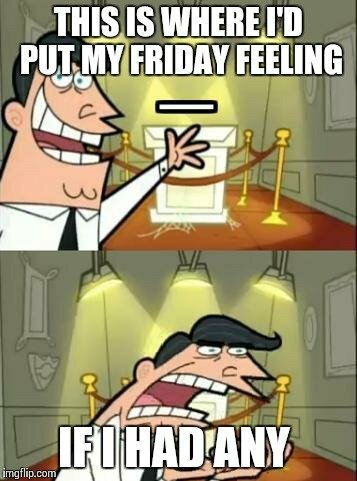 Do you feel the same when your friend talks about enjoying the weekend? You find yourself working when everyone else is partying. Is this justified? All hospitality professionals at least deserve free drinks to work on weekends when the shift ends. Here is a funny picture to display the right emotions. Have a look to check if you can connect some day of your past with this funny picture. At times the hoteliers have to work super long shifts, especially during busy season. It is not uncommon to have 12-14 hours shift and that looks like a never-ending shift. Some of you may be smiling by 12-14 hours as you might have had even longer shifts during peak season. Do you remember the peace on your face when you felt that finally, the day is going to get over now? This lovely funny picture explains how most of the hoteliers feel when they are about to go home. Guests always expect more in Hotels. Isn’t that true? If they find one mistake they come shouting and do not settle without freebies. At times the expectations are too high and this is what comes to your mind as displayed in the funny picture. There are numerous other funny situations at Front desk and at times troublesome as well. We also have a list of Strangest guest complaints in another post should you want to refer to more examples like above. When a lot believe housekeeping a tough job, it is at times more difficult than we perceive it to be. Unexpected things are on the cards for Housekeeping Team members. You never know what is in store next. 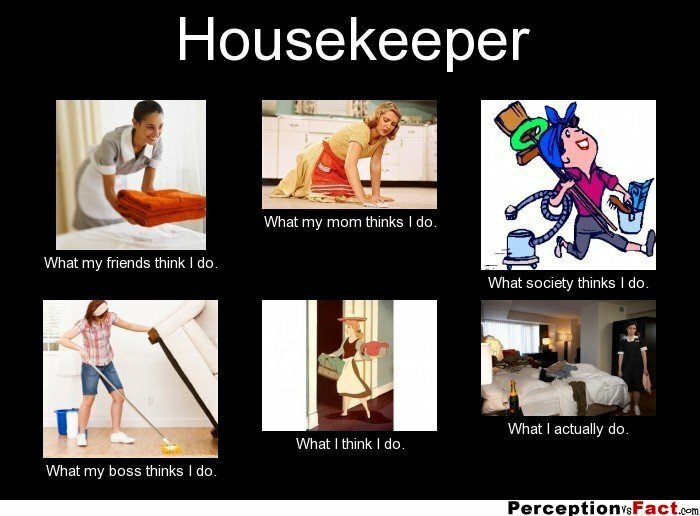 Let’s explore the job description of housekeepers through one of the funny pictures. While this fun pic outlines what a housekeeper is expected to do, it explains the various shades of work of housekeeping team. Hotel Manager has a responsibility to see off the complete set of activities at the Hotel. Hospitality jobs are considered trendy and fashionable. It sure is a fashionable job but at times the reality is different. 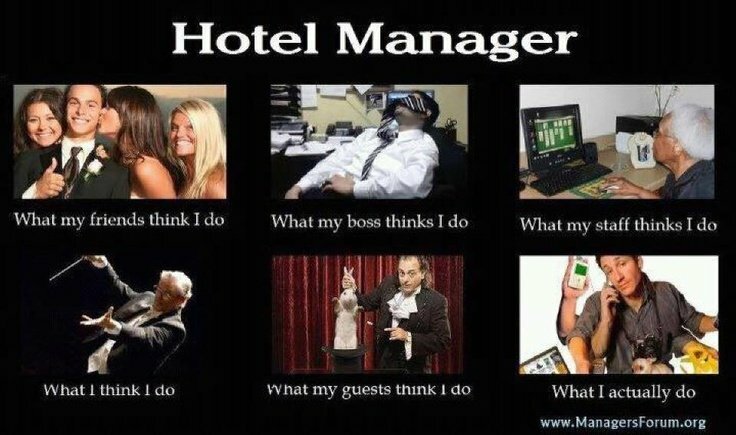 Do you agree with the funny picture below about the job of a Hotel Manager? You don’t need to say anything. Your expression has said it all! Yes, it’s front desk again. May it be housekeeping, reservation or general complaint, it’s the Front office that faces the maximum flak. 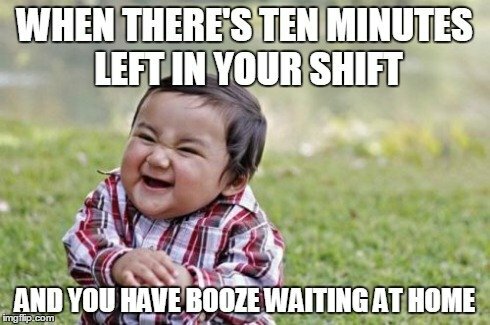 After a day full of activities from check-ins to complaints and what not, all you wait for is to finish the shift on a high. How do you feel when you have a guest on reception when you are about to leave? 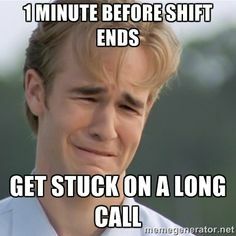 And, when you are stuck on a long call when you just finished. This funny picture explains it all. If you work in a retail shop selling all those super expensive designer dresses designed by someone you don’t even know and selling those souvenirs and mementoes for horrific prices, then you must have gone through this pain sometime. This fun pic is tailor-made for all of you who work at these establishments. This is even true for restaurants and coffee shops. You might just can’t stop thinking that why do guests spend all the time in the room before deciding to step out just before you are closing. You don’t need to disclose what comes to your mind when someone enters the place as you are about to close. Funny and terrible. We leave this for you to ponder upon. 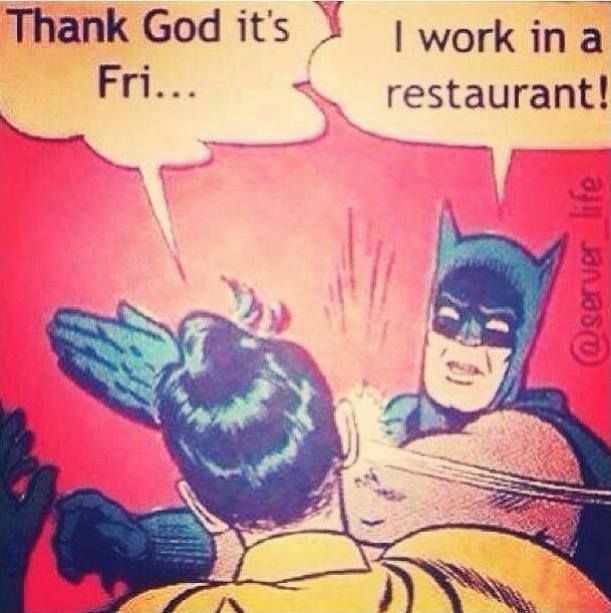 Finally, the same Friday blues that all hospitality professionals suffer from, barring a few lucky ones. Most of the hospitality workers have to work on Fridays. We hear about robots working in some Japanese hotels. Can they not come over to work on the weekends for every hotelier? The below funny picture displays the feelings of a hospitality professional. 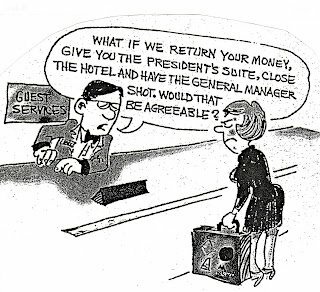 Hope you liked these funny pictures related to the hospitality industry and by this post, we just wanted to add a fun angle to hospitality. We don’t endorse these thoughts and it is only for bringing a few smiles to hardworking and smart hospitality fraternity. There are numerous benefits to working in the hospitality industry and we have numerous posts on this website to showcase the same.